What They Say....Lisa Scottoline delivers another searing, powerful blockbuster novel that explores hot-button issues within the framework of an intricately plotted thriller. When a woman and her husband, desperate for a baby, find themselves unable to conceive, they decide to take further steps. Since it is the husband who is infertile, the heroine decides to use a donor. And all seems to be well. Three months pass and she is happily pregnant. But a shocking revelation occurs when she discovers that a man arrested for a series of brutal murders is her donor - the biological father of the child she is carrying. Delving deeper to uncover the truth, the heroine must face her worst fears, and confront a terrifying truth. Most Wanted is sure to be Lisa Scottoline's most discussed, bestselling novel yet. 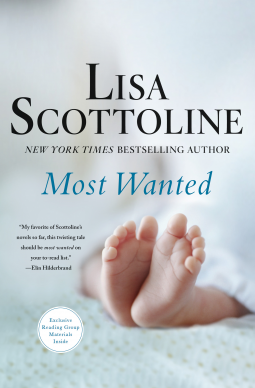 What I Say....I've never read a Lisa Scottoline book before, although I've seen them over the years, so I was excited to get an ARC of Most Wanted from St. Martin's Press. This book started off with a bang, Christine and Marcus have finally gotten pregnant via sperm donor after years of trying. They seem to have the perfect marriage and the perfect life. But then Christine catches a glimpse of a serial killer being arrested on the news and immediately is able to identify that this is her sperm donor. This didn't feel really believable - I mean, I can see pictures online all day long and never be able to match it to a person standing in front of me. (sometimes I think I have that disease that Brad Pitt has, that makes it impossible for him to remember faces). So this immediate recognition seemed a little far fetched for me. Christine's husband, Marcus, doesn't initially believe her, but as they make some calls to reassure her, it suddenly begins to seem that this might be a possibility. This was another moment where things got unbelievable. Suddenly, the grade school special ed teacher decides to go to the prison, and pretends to be a freelance writer who wants to write this serial killer's story. Of course, he proclaims his innocence and asks for her help in clearing his name. And she decides for the sake of her unborn child, that she wants to help. So now she finds him a local lawyer, pays for this lawyer, and then begins to work for the lawyer, becoming a detective, even after a neighbor is murdered, and things become increasingly dangerous. It was a pretty fast paced book, and it wrapped up with a nice ending. I struggled a little bit with the believability factor, but I've read some other reviews that said this wasn't her best, so I think I'll try her again in the future.